I love how versatile quinoa is - you can do almost anything with it. I've even used it as a breakfast cereal. 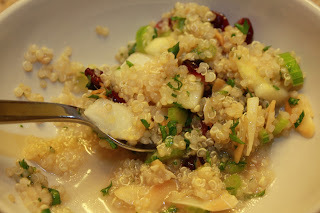 Anyway, I've been collecting new quinoa recipes and finally tried one that I came across on the FamilyFun.com website, which I would like to share with you today. It's fruity and crunchy all at the same time. Some quinoa salad recipes can stand on their own as a meal, but this one I think is better suited as a side salad or an accompaniment. Try it - you'll love it! In a medium-size saucepan, combine the quinoa and water, then bring them to a boil. Reduce the heat and simmer, covered, until the quinoa is tender and the water is absorbed, about 15 minutes. Transfer the quinoa to a large bowl, stir, and let it cool completely. In a small bowl, whisk together the honey, lemon juice, and salt. Gradually whisk in the oil until blended. Add the apple, celery, craisins, parsley, and almonds to the quinoa and toss the ingredients well. Add the dressing and toss once more to coat the salad. Season it with salt and pepper to taste. Awesome Recipe. Quinoa is the new black.